If you are looking at new carpet, Berber carpet is a popular choice for high traffic areas. It has a reputation for being highly durable and easy to clean. When shopping around, you will find numerous styles and pile fibers. Berber originated in a region of northern Africa. A tribe by the name of Berber created hand-spun, textured floor coverings made of natural fibers. The name refers to the weave, not the type of fibers used. Today, Berber carpet is the term used to describe all broadlooms that resemble the floor coverings and cloaks the Berber tribe made. It uses flecked yarns and loops to create the look. The first Berbers sold in the industrialized world were made of wool, which closely resembled the original coverings. However, wool was both expensive and created limitations on coloring choices. All original Berber was light and neutral or natural looking in color. 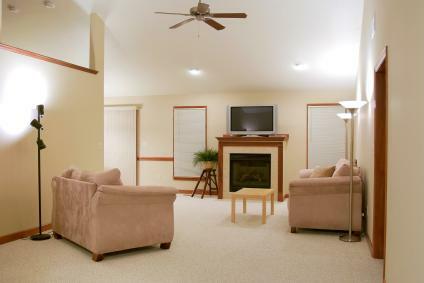 The fibers used determine the price, durability and stain resistance of the carpet. Olefin is the most common fabric found in Berber carpeting. Wool and nylon are harder to find and more expensive. Blends of nylon and olefin are also common. The majority of carpets you can purchase are made from nylon. Nylon is a synthetic fiber and is easy to clean. It is the strongest fiber that Berber carpets are made of, and it is non-allergenic. It is also both soil and mildew resistant and perfect for heavy traffic rooms. On the down side, nylon fabrics can pill and are prone to static. Wool is the both the best looking and hardest to find of all the Berber carpets. It offers a more sophisticated look with a cushiony feel. Since it is made from the wool of sheep, it is environmentally friendly. Wool is naturally hypoallergenic and non-toxic, easy to clean, and stain resistant. It is also more expensive than nylon or olefin. There are numerous advantages to purchasing Berber carpeting over a traditional thread. Cost effective: Berber is often cheaper than plush carpets. Stain resistant: The carpet is easy to clean. Durable: Since the loops are tight and the carpet is more dense, footprints do not wear the carpet the same way as traditional carpet. Dirt resistant: The style of loops make it hard for dirt to get deep down into the carpet. Too many choices: Do your research. Some Berber carpets are inferior to others. Unraveling: If a part of the carpet gets hooked on a pet's claw or a high heel, the carpet can begin to unravel. If you have cats, they may mistake the carpet as a scratching post. Staining: Oil based stains tend to bond with the carpet and will never come out. Large loops: Carpets with large loops show wear quicker than those with smaller loops because they are heavy and do not bounce back up. Difficult to deep clean: Since the carpet is so dense, it is hard to remove dirt that does sink below the surface. Olefin: Try steam cleaning with high extraction water recovery. Nylon: Vacuum often and dry carpet clean when needed. Wool: Since it is hard to find and expensive, take extra good care of it. Vacuum regularly and hire a dry cleaner when needed. Be sure to visit your local carpet showrooms as well to get to know the installers and the product at the same time. If you decide to go with Berber carpet, olefin with smaller loops is the highest recommended carpet. Experts suggest using a 1/4 inch padding. If you are getting wool or nylon, ask the carpet salesperson for recommedations on padding.